informazioni levitra originale 20 mg Since I was introduced to Asian style food in elementary school, I have been a giant fan from the first bite. My daughter has never not known the flavors and textures of traditional Asian cooking, and Mr. Locke just adores it, too. http://cinziamazzamakeup.com/?x=acquistare-viagra-generico-25-mg-a-Firenze So, when we visited Manhattan last month, it only made sense to head to Times Square and try Ruby Foo’s. The restaurant has expertly melded the cooking styles and flavors of Thai, Chinese, and Japanese food, and in doing so has three new fans that cannot wait to head back to Times Square and dine. order brand levitra from online pharmacy Gentlemen, start your proverbial engines because I’m taking you on an Asian fusion culinary trip! get link This one was right up Mr. Locke’s alley. The Ginger Margarita uses Milagro Blanco Tequila, fresh cilantro, and ginger juice. His one word to describe? Yummy! canada drug pharmacy generic viagra I’ve never considered raspberry and mint working well together, but it truly does in Ruby’s Raspberry Smash. http://maientertainmentlaw.com/?search=best-price-free-viagra-internet Dim Sum is the lighter fare you’ll find in Asian Restaurants. The entire menu is made in-house from scratch and the flavors are traditional yet with Ruby Foo’s own twist. dosaggio levitra originale 20 mg I’m loving the plating for Ruby Foo’s Dim Sum! Ever since The Kid and I tried steamed buns last year, we’ve been hooked. The Steamed Pork Buns at Ruby Foo’s are filled with slices of pork belly, bacon, and jalapeños. Of course, if you’re not into spicy, just ask for them without the peppers. The soft texture of the steamed bun combined with the pork belly is so complimentary- and delicious! For Summer Restaurant Week, Ruby Foo’s is offering Soft Shell Crab Steamed Buns as well. These beauties are filled with pickled jalapeños, Napa cabbage, and Japanese style tartar sauce. If you’re a fan of seafood, these will be right up your alley. We attempt to make our own lettuce wraps at home, but they don’t even compare to the Chicken Lettuce Wraps we enjoyed during our visit. The chicken is cooked in teeny pieces with veggies and hoisin sauce gives them that flavor kick that is so traditional in Chinese cooking. Brought to the table with lettuce leaves that you can either wrap up or just fill and enjoy, this appetizer is hearty enough as an entree if you’re not too terribly hungry. The entree selection at Ruby Foo’s is impressive. With traditional Asian entrees like Lo Mein and Stir Fry, there’s also While Fried Fish and Duck Fried Rice. Always a huge fan of Pad Thai, I had no choice but to try the Ruby Foo’s version. The entree usually comes with shrimp for protein, but I asked to swap it out for chicken and it was perfection on a plate. Loaded with rice noodles, bean sprouts, and peanuts, The textures complimented each other perfectly and the order was not so heavy that I felt I needed a nap afterwards. How’s this for beauty? That’s the lovely Chile-Glazed Shrimp and Scallops. 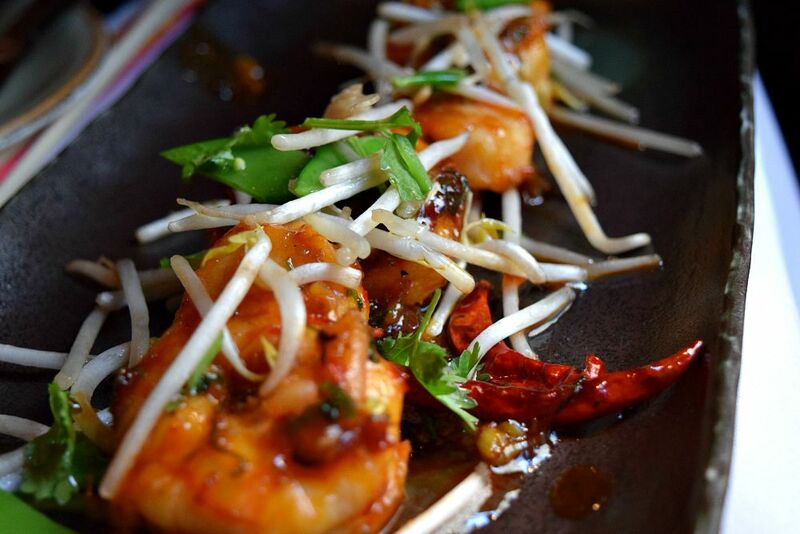 Topped with just a touch of snow peas and bean sprouts, Mr. Locke was in spicy heaven. The Kid loves to eat Sushi as her entree (honestly, so does Mr. Locke!) so there was no way we could leave the restaurant without trying a roll or two. Or three. 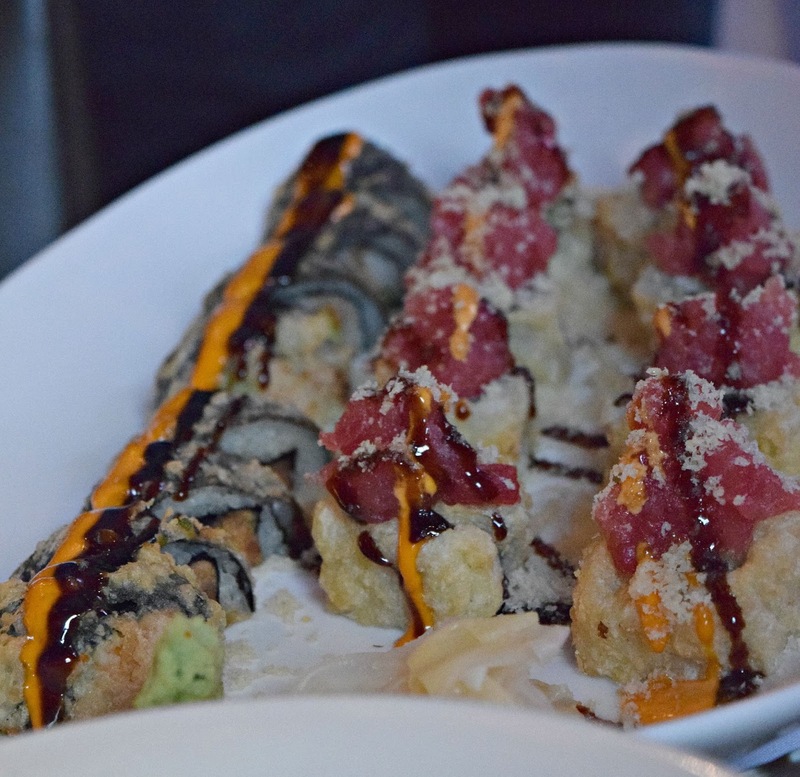 The Monster Roll and California King Tempura roll. It’s amazing just how filling sushi can be and how much preparation and skill goes into each one. Needless to say, They were both huge hits at our table. Another Restaurant Week specialty, the Shrimp and Asparagus roll is wrapped in soy instead of nori. Along with the shrimp and asparagus, there’s Japanese pickles, avocado, and kimchee aioli. I’m all for aesthetically-pleasing food and this one is just gorgeous. Well, Aren’t You the Sweetest! When we dine out in a big city, it’s always a special occasion for my family. And, along with the special occasion feel, we just have to try a dessert. Or three. 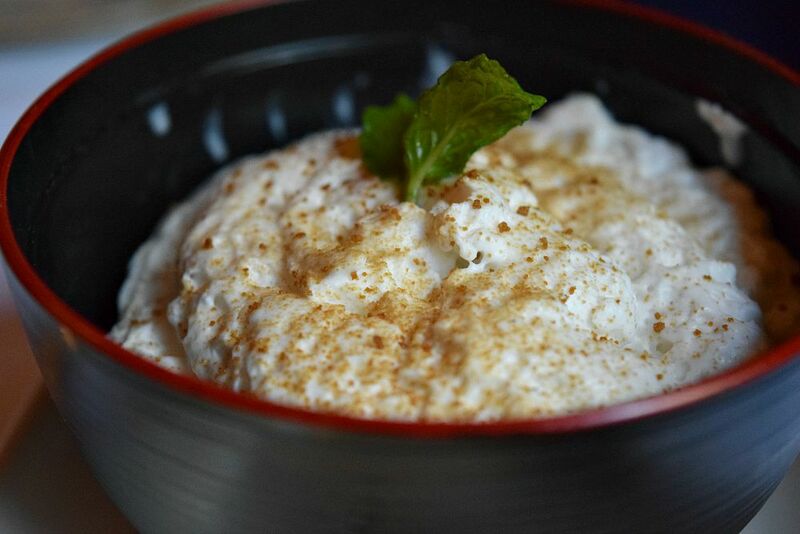 Let’s start with one that’s on the menu all of the time: Coconut Rice Pudding. A huge fan of comfort food, this dessert was my favorite. I’ve never tried rice pudding with an essence of coconut, but it definitely works. The surprise of spiced mango chutney in the middle was just delightful and complimented the tropical style of the dessert. 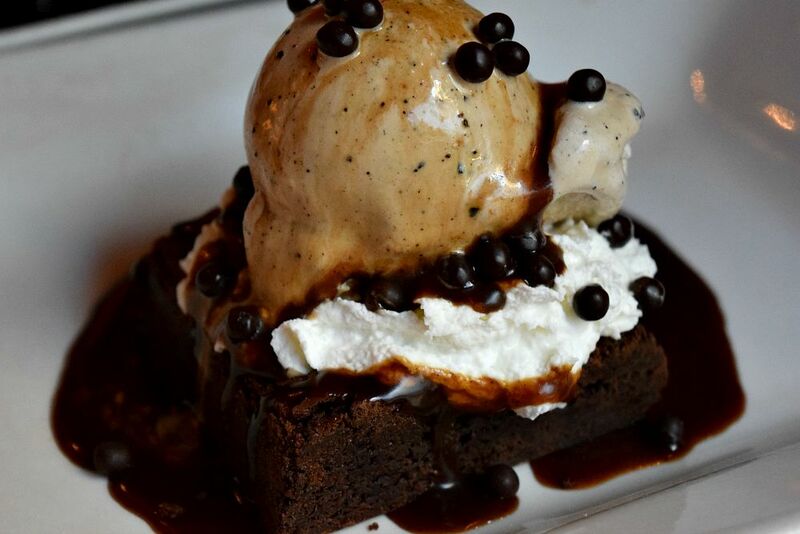 Espresso caramel, Turkish coffee gelato, and fresh whipped creams mothers the decadent chocolate brownie underneath. Mr. Locke told me that this dessert has spoiled him for life. This one’s from the Restaurant Week menu, so if you’re in Manhattan this summer, get it while you can. Another Restaurant week exclusive, the Market Blueberry Shortcake offers lemon yogurt cake, blueberries laced with ginger, and vanilla gelato. This dessert is the essence of summer, in my opinion and was a favorite with The Kid. 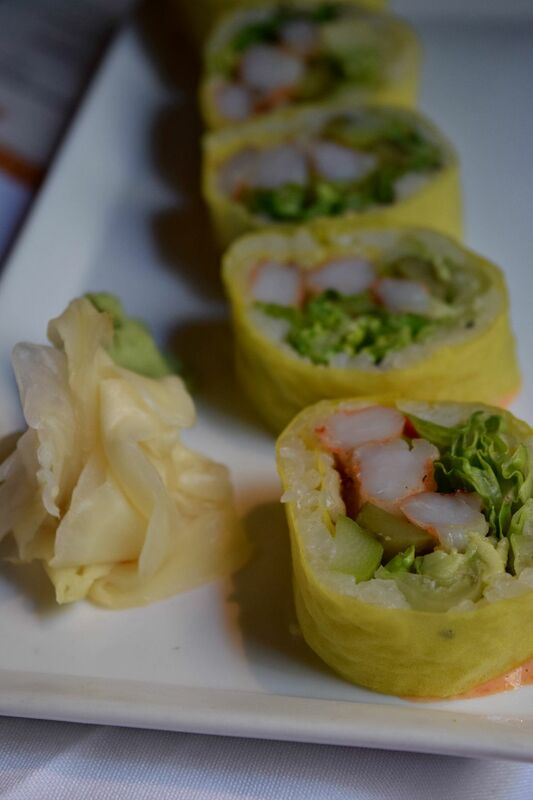 Ruby Foo’s has the ability to provide finer dining in the heart of Times Square. It’s just incredible, when you’re inside the restaurant there’s a laid back, calmness but just look outside and there’s the hustle and bustle of the city. The rich hues of red and gold are throughout the space and meals are presented on crisp, white linens. You can find Ruby Foo’s in Times Square at 1626 Broadway at 49th Street. If you’re heading to the Theater district, it’s a great place to dine compliments of the convenient location. Disclosure: I was hosted by Ruby Foo’s and BR Guest Hospitality to give you fine folks the scoop on what makes this restaurant so great. I was not asked to state a particular point of view and all opinion are my own!